The I-MON High Speed series allows full spectrum measurements up to 35 kHz, while maintaining sub-picometer wavelength fit resolution. It is rugged, making it well suited for both industrial-grade applications and lab-type experiments in combination with a customer selected light source. It comes with GigE interface and software for plug-and-play operation. LabVIEW based software allows customization and simple interfacing with light sources and other test equipment. 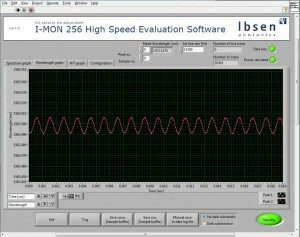 The I-MON 256/512 High Speed is designed for demanding applications requiring high speed, real-time analysis, while maintaining sub-picometer wavelength fit resolution. With its EMC shielded housing and reinforced fiber, the I-MON is highly rugged and well-suited for both industrial applications as well as lab-type experiments. 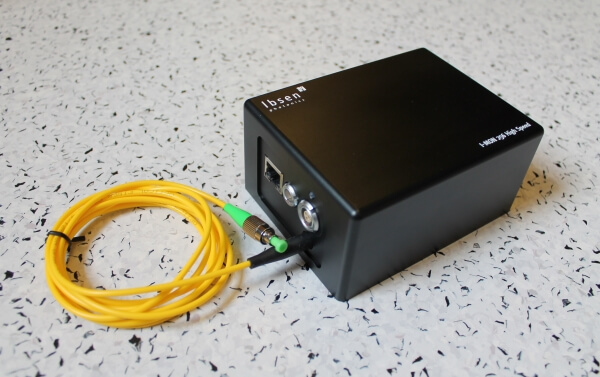 To demonstrate the capabilities of the I-MON 256 High Speed, Ibsen has made a measurement of the wavelength modulation from a piezo actuated FBG sensor with a 1 kHz tone. As seen from the picture to the right, the I-MON 256 High Speed resolves the modulation perfectly.